Members of the Pacific Flyway Council and its technical advisory groups, the Pacific Flyway Study Committee and Nongame Technical Committee, meet regularly to disseminate information, combine data, review the status of populations, propose annual hunting and other regulations, develop cooperative management programs, and coordinate research and management for the protection and conservation of migratory birds. The Council has two business meetings each year, usually in March and August or September. 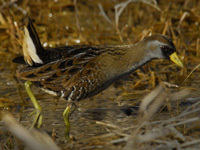 August or SeptemberHunting regulations for all migratory game birds. This includes migratory shore and upland game birds (doves, pigeons, snipe, rails, and cranes) and waterfowl (ducks, geese, and swans). The Council also considers special early (September) waterfowl and extended falconry seasons, and all of Alaska's seasons. The Study Committee has two business meetings, usually in February and August or September, and a non-business work session, usually in December or January, each year. December or JanuaryIdentification of issues and development of work plans for the upcoming year, and development of cooperative management programs. August or SeptemberHunting regulations for all migratory game birds. This includes migratory shore and upland game birds (doves, pigeons, snipe, rails, and cranes) and waterfowl (ducks, geese, and swans). The Study Committee also considers special early (September) waterfowl and extended falconry seasons, and all of Alaska's seasons. The Nongame Technical Committee has two business meetings each year, usually in February and September, and may have a non-business work session in December or January. Meetings are usually held in conjunction with the Study Committee meetings. Additionally, the Committee holds conference calls as needed to discuss and develop written comment on proposed actions in the Federal Register. Unlike the Study Committee, the Nongame Technical Committee addresses a changing suite of topics at each business meeting due to the variety of proposed federal regulations and other issues associated with nongame migratory birds. The Alaska Migratory Bird Co-management Council (AMBCC) holds 2-day meetings in spring (usually early April) and also in fall (usually late August), which are preceded by a half-day work session and meetings of AMBCC committees. The meetings involve reports by Alaska Native representatives from each subsistence region, reports by agency staff on topics of management and conservation interest, and consideration of regulatory proposals. Contact the AMBCC Executive Director for meeting dates and locations. Publics wishing to provide input on proposed migratory bird management actions and regulations are encouraged to contact their state agency representatives. Publics may also provide comment by attending the Pacific Flyway Council meetings in March or September or by submitting written comments to the Council chairperson. The rulemaking processes of individual state and federal governments all have a public comment period. The federal rulemaking process and opportunity for public input is described in the Federal Register. Photo credit: canvasbacks, photographer unknown; sora, G. Andrejko. Band-tailed pigeon (Photo by T. Sanders).